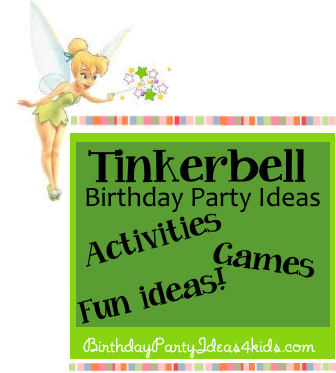 Fun ideas for a Tinkerbell themed birthday party! Find the perfect ideas that will make your Tinkerbell party extra special! You’ll also find on Birthday Party Ideas 4 Kids lots of fun games, sleepover ideas, slumber party games, scavenger hunts and over 200 birthday party themes to choose from! Let Birthday Party Ideas 4 Kids help get the party started! Ideas for boys and girls, kids, tweens and teens ages 1, 2, 3, 4, 5, 6, 7, 8, 9, 10, 11, 12, 13, 14, 15, 16 and 17 year olds. There are also links to our Fairy birthday party ideas for even more options on party games and activities.